The Sweetwater County Library does its best to provide books of all genres. Included are books about the paranormal. New on our shelves is The Big Book of Ghost Stories by authors Joyce Carol Oates, Rudyard Kipling, Isaac Asimov and James Maccreigh, Saki, Oscar Wilde, H. R. F. Keating, Willa Cather and Many, Many More. The ghost story is perhaps the oldest of all the supernatural literary genres and has captured the imagination of almost every writer to put pen to the page. Here, Edgar award-winning editor Otto Penzler has followed keen sense of the supernatural to collect the most chilling and uncanny tales. These spectral stories span more than a hundred years, from modern day creations by Joyce Carol Oates, Chet Williamson, and Andrew Klavan, to pulp yarns from August Derleth, Greye La Spina, and M. L. Humphreys, to the atmospheric Victorian tales of Rudyard Kipling, Edith Wharton, and H. P. Lovecraft, not to mention modern works by the likes of Donald E. Westlake and Isaac Asimov that are already classics. Some of these stories have haunted the canon for a century, while others are making their first ghoulish appearance in book form. Whether you prefer possessive poltergeists, awful apparitions, or friendly phantoms, these stories are guaranteed to thrill you, tingle the spine, or tickle the funny bone, and keep you turning the pages with fearful delight. Mr. Arcularis, August Heat, The Shadowy third, The Past, But at My Back I Always Hear, The Furnished Room, Death’s Warm Fireside, The Advent Reunion, the Return, the Phantom Rickshaw, The Moonlit Road, the Story of Ming-Y, Yuki-Onna, Bricket Bottom, How Fear Departed from the Long Gallery, Thing of Darkness, The House of the Nightmare, The house in Half Moon Street, A Night of Horror, The Burned House, Harry, Make-Believe, Playmates, Just Behind You, Adam and Eve and Pinch Me, The Lost Boy of the Ozarks, A Ghost Story, In at the Death, The Ghost of Dr. Harris, The Everlasting club, Legal Rites, Death Must Die, The Transferred Ghost, The Canterville Ghost, Pacific 421, The Midnight El, Punch and Judy, The Fireplace, The Night Wire, Smoke Ghost, Song of the Dead, The Dream Woman, The Adventure of the German Student, They Found My Grave, Mrs. Morrel’s Last Séance, Night-Side, Oh Whistle and I’ll Come to You My Lad, The Monkey’s Paw, The Toll-House, Afterward, Consequences, The Follower, The Corner Shop, the Terrible Old Man, The Murderer’s Violin, The Open Window, Laura, What Was It?, Full Fathom Five, He Cometh and He Passeth By, Thurnley Abbey, The Woman’s Ghost, The Angel of the Marne, The Shell of Sense, The Evenging of Ann Leete, The Dead-Wagon, A Soul with Two Bodies, the Ghosts of Steamboat Coulee, The Considerate Host, The Fifth Candle, the Return of Andrew Bentley, The Floor Above, School for the Unspeakable, Mordecai’s Pipe, He Walked by Day, Behind the Screen, Journey into the Kingdom, Mr. Soul, and Coventry Carol. Stop by your local library where you will be sure to find many stories that appeal to your paranormal senses. For any of you that are familiar with the Sweetwater County Library and the reported haunting you would have heard us mention that PI Team of Utah. They are a professional ghost hunting team from the Ogden, Utah area that is the Utah affiliate of TAPS. PI Team of Utah has investigated the SWC Library as well as hosted a program at our location. Because of our close relationship with them we would like to take this time to announce to our patrons that our good friends at PI Team of Utah are hosting a fundraiser for their team member that has passed. If you are interested in joining them for an evening of food, fun and a paranormal investigation here is your chance. 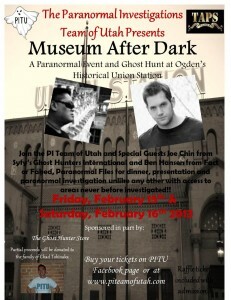 Come join the PI Team of Utah and special guests Joe Chin from Syfy’s Ghost Hunters International and Ben Hansen from Fact or Faked, Paranormal Files for a meet-n-greet, dinner, presentation, raffle for awesome prizes and a paranormal investigation that will include areas of the station never before investigated!! Tickets went on sale January 1, 2013 @ 10 AM at www.piteamofutah.com or on PITU Facebook page. This is a private event so there will be a limited amount of tickets available! Tickets are $75 per person per event. For more information visit the PI Team of Utah website at http://www.piteamofutah.com/. I will be attending. Hope to see you there.